The Holy Martyr Mamant was born in Paphlagonia of pious and illustrious parents, the Christians Theodotos and Ruphina. For their open confession of their faith, the parents of the saint were arrested by the pagans and locked up in prison in Caesarea Cappadocia. 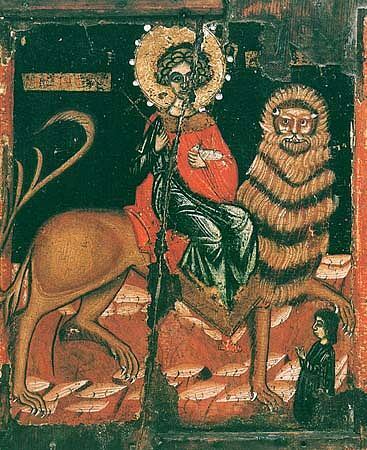 Knowing his own bodily weaknesses, Theodotos prayed, that the Lord would take him before being martyred. The Lord heard his prayer and he died in prison. Saint Ruphina died also after him, having given birth to a premature son, whom she prayerfully entrusted to God, beseeching that He be the Protector and Defender of the orphaned infant. God hearkened to the death-bed prayer of Saint Ruphina: a rich Christian widow named Ammea reverently buried the bodies of Saints Theodotos and Ruphina, and she took the boy into her own home and surrounded him with motherly care. Saint Mamant grew up in the Christian faith. His foster mother concerned herself with the developing of his natural abilities and early on she sent him off to study his grammar. The boy learned easily and willingly. He was not of an age of mature judgement but distinguished himself by maturity of mind and of heart. By means of prudent conversations and personal example young Mamant converted many of his own peers to Christianity. There was a denunciation about this to the governor, named Democritus, and the youth was arrested and brought to trial. In deference to his illustrious parentage Democritus decided not to subject him to torture, but instead sent him off to the emperor Aurelian (270-275). The emperor tried at first kindly, but then with threats to turn Saint Mamant back to the pagan faith, but all in vain: the saint bravely confessed himself a Christian and pointed out the madness of the pagans in their worship of mindless idols. Infuriated, the emperor subjected the youth to cruel tortures. They eventually wanted to drown the saint, but an Angel of the Lord saved Saint Mamant and bid him live on an high mountain in the wilderness, located not far from Caesarea. Bowing to the will of God, the saint built there a small church and began to lead a life of strict temperance, in exploits of fasting and prayer. Soon he received a remarkable power over the forces of nature: wild beasts inhabiting the surrounding wilderness gathered at his abode and listened to the reading of the Holy Gospel. Saint Mamant nourished himself on the milk of wild goats and deer. The saint did not ignore the needs of his neighbours: preparing cheese from this milk, he gave it away freely to the poor. Soon the fame of Saint Mamant's life spread throughout all of Caesarea. The governor in concern sent a detachment of soldiers to arrest him. Coming across Saint Mamant on the mountain, the soldiers did not recognise him, and mistook him for a simple shepherd. The saint then invited them to his dwelling, gave them a drink of milk and then told them his name, knowing that a suffering death for Christ awaited him. In surrendering himself over into the hands of the torturers, Saint Mamant was brought to trial under a deputy governor named Alexander, who subjected him to intensive and prolonged tortures. But they did not break the Christian will of the saint. He was strengthened by the words addressed to him from above: "Be strong and take courage, Mamant". When they gave Saint Mamant over for devouring by wild beasts, these creatures would not touch him. Finally, one of the pagan-priests struck at him with a trident-spear. Mortally wounded, Saint Mamant went out beyond the city limits. There, in a small stone cave, he offered up his spirit to God, Who in the hearing of all summoned the holy Martyr Mamant into the habitation on high (+ 275). He was buried by believers at the place of his death. Christians soon began to receive from him blessings of help in their afflictions and sorrows. Saint Basil the Great speaks thus about the holy Martyr Mamant in a sermon to the people: "Commemorate ye the holy martyr: those, who saw him in a vision, who from amongst the living here have him as an helper, those whom in calling on his name he hath helped in some matter, those whom he hath guided out of a prodigal life, those whom he hath healed of infirmity, those whose children already dead he hath restored to life, those whose life he hath prolonged – all of ye, gathered as one, praise ye the martyr".